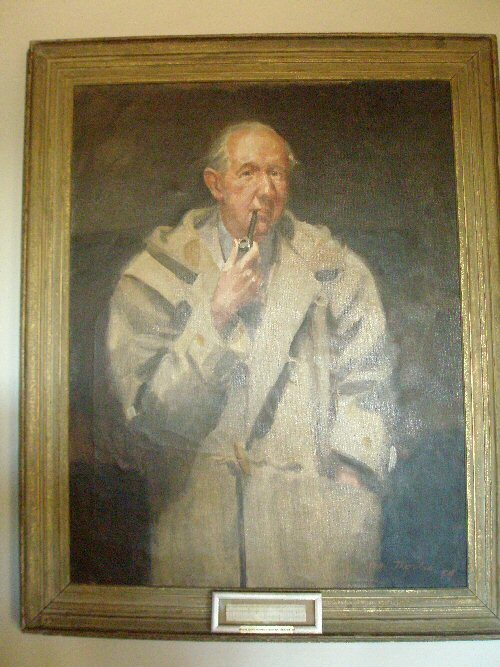 In the long run, it is intended to create a museum of Nevil Shute artefacts. The location has yet to be decided, but planning is already underway. 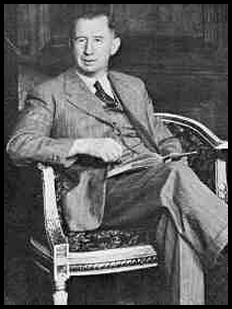 To complement it, a "Virtual Museum" of photographs of items relating to Nevil Shute's life is being constructed on the website. Photographs of any items which can be included are welcome. 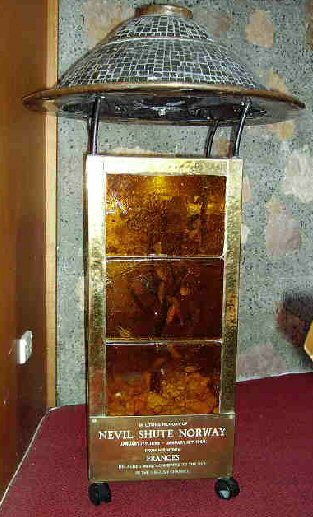 These two ashtrays were donated by Terry Miller of Portsmouth. 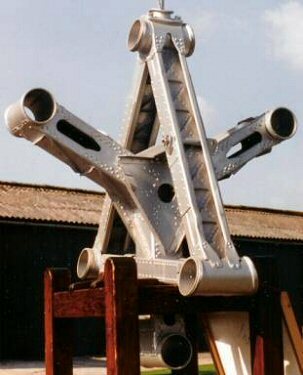 They were brought home from the Airspeed factory on the airport site at Portsmouth by his father in the 1960's. 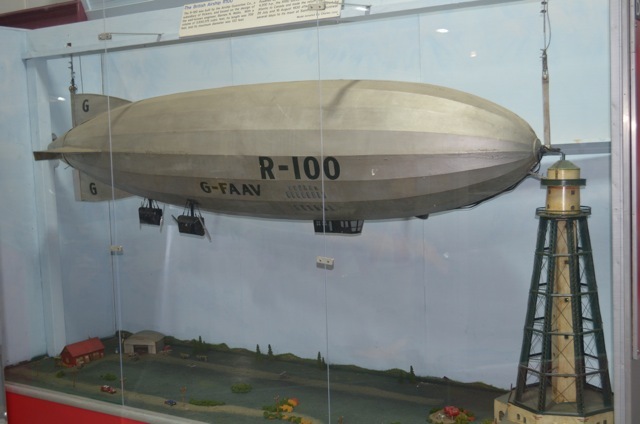 Each is engraved with "Airspeed (1934) LTD" on the top. The one with less wear also has "No 20" one-third of the way around the top. The other doesn't appear to be numbered, but it is difficult to be sure because of the wear on the finish. Both have "Made in England" on the reverse. The ash trays are approximately 3 3/4" across and 1 1/2" deep. 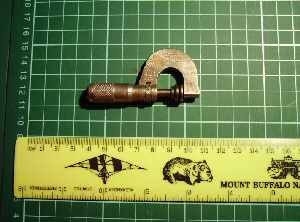 They appear to be made of brass and plated with nickel. They are presently held by Dan Telfair. An astronomical instrument for finding and interpreting information from the stars, such as their position at a given time, or the length of day or night. This is also in the care of the Dragon School, Oxford. 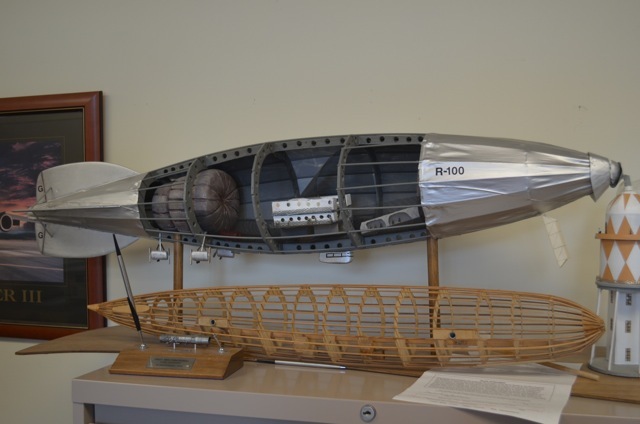 "Runagate"was built for Nevil Shute by David Hillyard's in 1939. She is a 40ft long 11ft beam sailing ketch with accommodation for 7. Shute owned and sailed her until he left England in 1950. 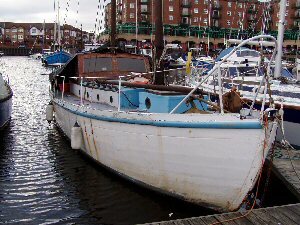 Since then she has had several owners and is currently (2007) afloat in a yacht marina on the River Tyne. This is a slide rule of the type that was used in the stress calculations on the R.100 structure. 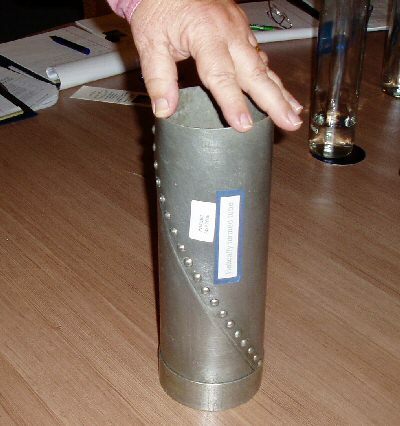 It is cylindrical and has a spiral scale. If opened out the scales would be over 40 feet long thus giving much greater accuracy than a normal slide rule. 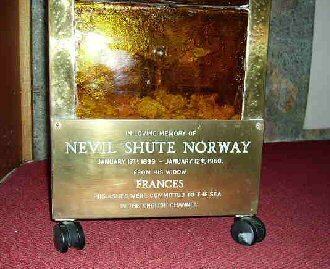 As Nevil Shute mentions in "Slide Rule" his staff worked in pairs with these instruments to check for numerical accuracy. 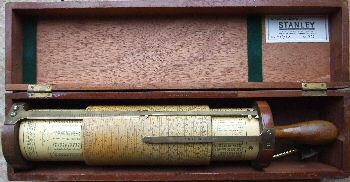 The Fuller Slide Rule shown is from the 1920's and is jointly owned by Shutists Mike Meehan and John Anderson. 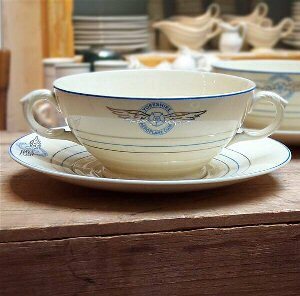 This soup bowl set is an original from the Yorkshire Aeroplane Club circa 1920's when NSN was a director there, and is one of a pair purchased by Mike Meehan from an antique shop in Chicago and donated to Laura Schneider for her management of the Alice Springs conference 2007. 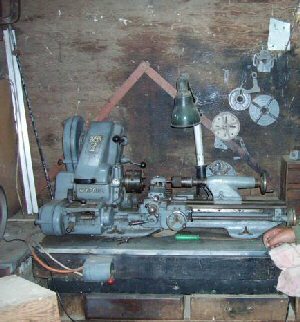 This is a Myford 7 lathe which he used in his workshop in Australia. It is exactly the same as Keith Stewart had in his workshop in "Trustee from the Toolroom" and is a type widely used by model makers. On the wall behind are attachments including faceplates and workholders. The lathe is now in the care of Fred Greenwood. It is now owned by Shutist Tommy Thomas. 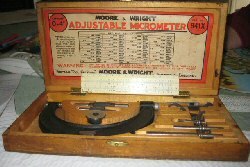 This is a 0-4" micrometer set owned by Nevil Shute, complete in its box. Using the various barrels it is possible to measure items, for example turned parts, up to 4" with high accuracy. 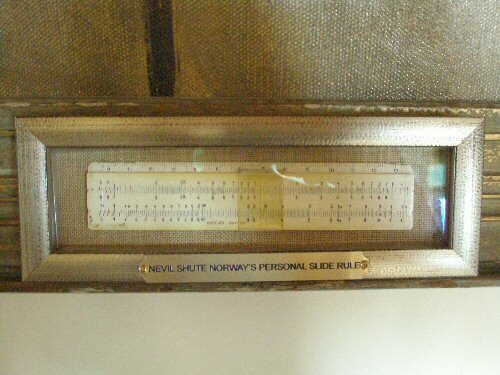 Also shown is his 6" slide rule, probably of 1950's vintage, which seems to be missing its cursor. These items are now in the care of Fred Greenwood. 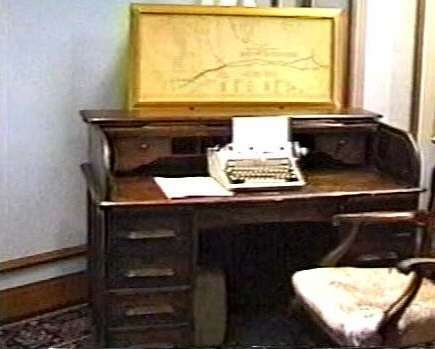 Nevil Shute's roll top desk given to him by his parents and at which he wrote most of his novels. The desk was on display at the Centennial celebrations in 1999. The typewriter is not his but is of an make similar to the one he used to type his later novels. On top of the desk is a framed map showing the route of R.100 to Canada and back.